Erie County (NY) is officially in a severe drought. With record low snows this past Winter, an unusually dry Spring and nearly rainless Summer, Erie County, especially the metropolitan ring of Buffalo, is experiencing some of the driest conditions in over 75 years. For the Spring/Summer season thus far, we are down 7 inches in precipitation with no relief in site for the foreseeable future. While we do have a nice big lake to our west, many folks in our region rely upon well water. Moreover, this drought is extremely stressful for plants and, therefore, animals. On The Acre, we usually tend to the “formal” flower beds and vegetables (very conservatively, mind you) and leave the naturalized areas to fend for themselves. But the newer natives put in for habitat restoration are having a very difficult time of it so we’re beginning to irrigate small patches in order that some survive into future seasons. Even the well-established wild raspberries are in rough shape. These small, dry fruits are all we’ll harvest this year, choosing to leave the paltry remains for wildlife, giving them another source of moisture. The berries testify to the intensity of this drought – we usually harvest about 5 pounds each year and leave 5 times that much for wildlife. Erie Community College South Campus is located at 4140 Southwestern Blvd. in Orchard Park, NY. Email grahamm@ecc.edu with for further information. Homo sapiens love to claim a superiority over other species on the planet. We even have a loosely defined categorization method that generally places plants at the bottom followed closely by the “crawly” things (insects, spiders, snakes, etc.). High on the ladder just below our species we place the other primates. But it is not so simplistic since even within genetic families we differentiate (domestic dogs vs. wild canines, for example). And from what I can tell, this hierarchy is pretty much based upon our own species’ ego, likes and dislikes as individuals and societies, and/or religious convictions. 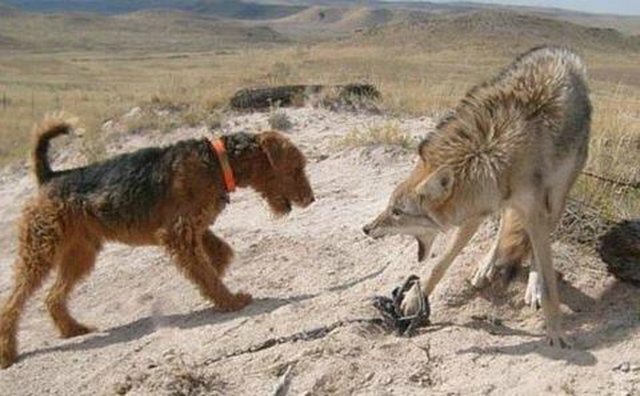 Trapped coyote being used as bait for the dogs of an employee of USDA’s Wildlife Services. What this unilaterally defined hierarchy demonstrates to this writer, however, is a lack of intelligence on the part of H. sapiens because our knowledge and understanding of the roles individual species play within the complex network of Earth’s systems is quite limited. Consider there are thousands of species we’ve not even identified, much less perceive the significance of their niches. There are a few more open-minded scientists who have challenged the lower levels of this pecking order, such as John Marzluff and his research on Corvidae, which flies in the face (pun intended) of previous “primates are the most intelligent animals” presumptions, but much more work along such lines should be done. This self-named species’ superiority is the entire problem behind the current mass extinction event the Earth currently is facing. The causes are clearly understood (human over-population, habitat destruction, over-consumption, lack of education, profiteering, etc.) – these all speak of a species nearly entirely self-centered and, thus, woefully misguided. The taking of a species’ life for a trophy is the epitome of self-centered egotism (one that is either too big, very fragile or potentially both). What other species causes such worthless death? What is wrong with H. sapiens? Is it a genetic mutation? Is our brain malfunctioning because it is more difficult for blood to reach it due to our “uprightedness?” Why do we as a species feel superior to all others? How has our existence improved the complex entity solely responsible for our survival – planet Earth? We seemingly have no beneficial niche unlike the other species with whom we share this blue marble. Pursuing another species in a fair “sporting” manner for food or because one is under deadly attack can be called hunting. Taking an animal’s life in order to hang its head on the wall, put a rug on the floor, pin its remains in a book, etc. is killing – and ALL such intentional killing, regardless of species, should be illegal. To recommend or inflict harm on those who collect animal trophies makes one no better than the trophy seeker. Pursue the higher ground and move for legislative and educational changes in our society. 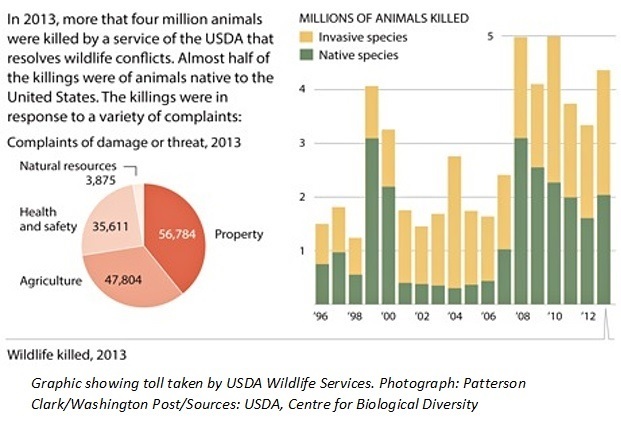 For those in the U.S., if you are concerned about the wanton death of wildlife, then focus some of your abhorrence on your federal elected officials and mandate they dissolve Wildlife Services – an arm of the USDA responsible for the deaths of millions of wild animals every year and funded by YOUR tax dollars (see https://www.revealnews.org/article/theres-a-reason-youve-never-heard-of-this-wildlife-killing-agency/ for the gruesome facts, as well as the graphic below). If you fear any wild animal or plant, educate yourself about the species. Learn what role it plays in the environment and understand how it benefits our own species. Knowledge can overcome fear and promotes tolerance. Homo sapiens (hoh-moh sey-pee-uh nz): n. – the only species on planet Earth knowingly engineering its own extinction. In celebration of Arbor Day, here are some suggestions for trees native to Western New York to consider adding to your landscape. If you are unable to add a tree to your own property (or don’t own property) consider purchasing one of these from a locally owned nursery and donate it to a park, school or other worthy organization. Remember, life is always better when you slap your heart up against a tree and give it a big hug! This species is fast growing, long-lived (up to 600 years) and at maturity is among the largest indigenous trees of New York State with a substantial trunk and crown. It is characterized by a lovely multi-colored bark of gray, green, brown and ivory (resembling camouflage). It is quite tolerant of road salts so will do nicely in areas impacted by road drainage. It does equally well in very wet conditions and in drier terrain. Well known to naturally populate in areas that have been disturbed by construction, erosion, etc., so soil quality is not an issue. Other common names are Planetree, American planetree, and buttonball tree. Confirm the scientific name when purchasing your trees to be certain you are getting the native species. American Sycamores can produce a large, wide crown. A species that can thrive in a wide varieties of habitats, the Red Maple can be a good choice for reforesting or creating a shady respite. Also called the Swamp, Scarlet and Soft Maple, A. rubrum is one of the most widely distributed trees in eastern North America, found from Florida all the way north to Newfoundland. and can tolerate soils from soggy to rocky. Under moist, fertile and well-drained conditions, the Red Maple can grow into a beautiful shade tree reaching about 80 feet tall at maturity and living up to 90 years or longer. This species of Maple produces red flowers very early in the year, long before buds begin to swell, so is a true herald of Spring. It can either be monoecious (having both male and female reproductive parts) or dioiceous (either male or female) so it is best to plant 2 or three if the goal is to have it reforest an area. Red Maple is a prolific seed producer (double samaras in Spring) which germinate easily and so readily gives rise to subsequent generations. Be advised, however, that seedlings are a favorite food of White-tailed Deer so should be protected from browsing until trees reach about 4 to 6 feet tall. As a bonus, Red Maple can be tapped for syrup and sugar production but, because it buds earlier than the Sugar Maple, sap extraction should be done only in the early part of sugaring season to ensure a sweet, quality product. We’ll diverge into the conifer world for our third tree by focusing on the Eastern Hemlock. This lovely native of Eastern North America (from the Smokey Mountains north to Ontario and Quebec) is special among the conifers in that it can co-exist in a mature forest of deciduous trees due to its wonderful ability to tolerate shade. Once a tree or two take hold, if undisturbed, a grove of Hemlocks can begin to flourish as they reproduce via tiny seeded cones. Known by naturalists for creating “blue shade,” the Eastern Hemlock is a very important tree for wildlife, particularly in Winter as it becomes food and shelter for White-tailed Deer who nibble on needles and bed themselves beneath protective branches. Birds and members of the Squirrel family also find relief from bitter winds and snows within the Hemlocks and enjoy the habitat a grove of these trees can create. The Eastern Hemlock is also among the longest living trees in the East, maturing at about 200 to 300 years old and living to or beyond 800 years. Although a slow grower in its youth, the Hemlock can eventually attain heights of about 125 feet. It tolerates a variety of soil types, but does best in moist, well drained areas. It produces a lot of tiny cones, but its seed does not germinate easily, succumbing to various factors or staying dormant until conditions are right for germination. Create yourself a nice windbreak and deep shade with the Eastern Hemlock and get satisfaction from knowing you are helping wildlife survive the toughest weather each year. Join us for this lunch-time lecture in celebration of Earth Day on Thursday, April 23 at Erie Community College South Campus. Habitat destruction due to human activity is the #1 cause of wildlife population declines and extinction. Learn how to stem this dangerous tide with tips for everyone, from landowners to apartment dwellers.